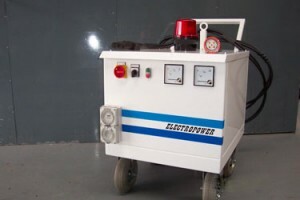 The ground power unit is designed for use with aircraft equipment. Designed for use in hangers and on the tarmac the powder coated, ventilated sheetmetal enclosure (IP23) is mounted on non marking inflatable wheels. One set of the wheels is fixed and the other set is swivel. A foot operated pad brake is fitted to maintain position in operation. A shopping trolley type handle is fitted for manual pushing of the trolley and a towing arm is fitted for use with a tow motor. 2 Metre primary lead with 5pin 32 AMP clipsal plug. 5 Metre 28VDC output lead with anderson 110368GO2 plug.